Leonard, Rodney E. "Letter from Rodney E. Leonard to Congressman Poage, July 15, 1966." 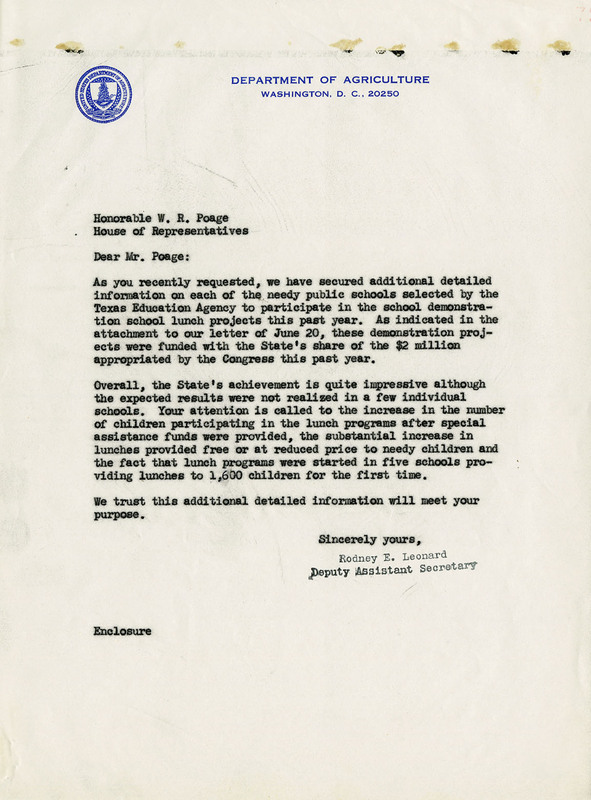 W. R. Poage Papers, Box 166, File 7, Letter from Rodney E. Leonard to Congressman Poage, July 15, 1966, W. R. Poage Legislative Library, Baylor University, Waco, Texas.. Accessed 19 April 2019. http://acsc.lib.udel.edu/items/show/463. Institute of Medicine (U.S.). Committee on Nutrition Standards for National School Lunch and Breakfast Programs; National school lunch program; School children--food; National school lunch program--Law and legislation; United States. W. R. Poage Papers, Box 166, File 7, Letter from Rodney E. Leonard to Congressman Poage, July 15, 1966, W. R. Poage Legislative Library, Baylor University, Waco, Texas.